Grantham Journal 19th May 1917 - Pte. James Buckingham, of Sedgebrook. 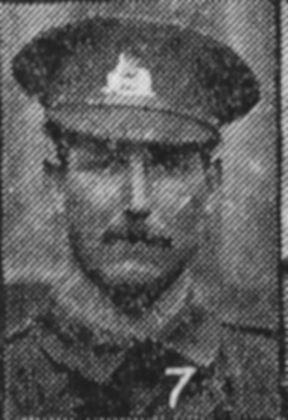 In the early post this week, Mr. and Mrs. John Buckingham, received official notification that her youngest son, Pte. James Buckingham, who was reported missing since July 3rd last, is now presumed dead. James Buckingham, was born in Gedney, Lincolnshire, in 1892. His parents were John and Hannah Buckingham John was born at Ickleford near Hitchin in 1862 and his mother, Hannah Rebecca Buckingham, was born in Hitchin in 1861. In 1901 the family of seven lived in Whaplode, Whaplode Lincolnshire. The Buckingham children were Annie (19), Sydney (17), Gertrude (14), James (8) and Alfred (6 months). John Buckingham worked as a yardman on a farm. By the 1911 Census the Buckingham family had moved to Breeder Hills, Sedgebrook near Grantham. John and James were employed as farm labourers, and Sydney as a waggoner. Annie the eldest daughter had married and she and her two children are listed as living with her parents. James Buckingham joined the Lincolnshire Regiment to serve as a Private with the 1st Battalion (Service Number 15446). He was posted to France on 22 June 1915. James Buckingham would experience over twelve months of active service on the Western Front. He finally served with the 1st Battalion, Lincolnshire Regiment at the Battle of the Somme. He survived the first two days of the Battle and was posted as missing on the 3rd July 1916. The Battalion strength on the 1st July 1916 was 40 ‘Officers’ and 994 ‘Other Ranks’. The Battalion suffered 109 casualties on the 1st day of Battle. They faired better on the 2nd July with 14 casualties. However on the 3rd July they were involved in heavy fighting. In the course of that day they sustained a total 243 casualties, including 37 killed and 9 reported missing. James was one of the missing. 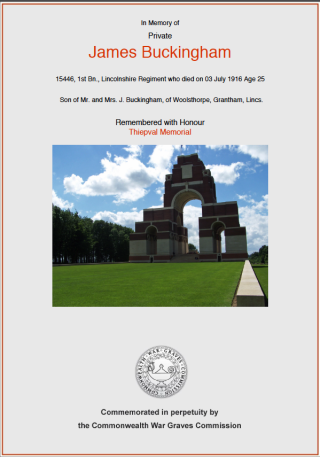 His body was never recovered and he is commemorated on the Thiepval Memorial. C.R. Simpson’s, ‘The History of the Lincolnshire Regiment 1914-198’, published in 1918, provides a vivid account of the 1st Battalion’s entry into the Battle of the Somme. North of the 17th Division the 1st Battalion, of the 21st, had severe fighting. Lieut.-Colonel Grant received orders at 5.30 a.m. to attack Birch Tree and Shelter Woods at 5.30 a.m., after a heavy artillery bombardment. The attack was made on a two-company frontage, each company on a two-platoon front. B Company attacked on the right and A on the left; D and C supported B and A respectively. The objective was a trench running along the northern edge of the two woods as far as the light railway on the right. Two minutes before 9 a.m., the artillery bombardment became intense and the German trenches and the woods to be attacked were shrouded in smoke from bursting shells. Five Stokes mortars, firing from Crucifix Trench, opened rapid fire and added to the noise. At 9 o’clock punctually, the leading pIatoons of the 1st Lincolnshire left the trench and rushed towards the enemy, but on reaching the ridge in front of the woods came under heavy rifle and machine-gun fire. A Company suffered heavily and their supports and C Company were rushed up. B, on the right, was more fortunate, and reached its objective without serious loss. Their supports and D then reinforced and, after disposing of all Germans found in the trench, consolidated the position. The battalion, however, in addition to numerous casualties, suffered a heavy loss, for Lieut.-Colonel Grant, who had led A Company to the attack, was seriously wounded in the head just as C Company reinforced the line. Captain T.G. Newbury then took over temporary command. On the flanks of the Lincolnshire heavy bomb. fighting and machine-gunning still went on, particularly on the left, where one squad of battalion bombers, in spite of constant attacks by the enemy’s bombers and machine-gun fire, succeeded in holding up a strong ‘party of Germans who were a grave threat to that flank. But presently reinforcements from the I2th Northumberland Fusiliers arrived and, after very little further resistance, this party of the enemy was captured. The centre of the attack experienced little opposition until the trench was reached, when large numbers of the enemy, who had taken refuge in dug-outs, were seen coming out in an endeavour to surround the Lincolnshire. They also were dealt with by the battalion bombers and many of them were killed. On the right, the resistance was not nearly as determined and a large number of prisoners were captured. By about 2 p.m., the wood was clear and the left flank secure, but the right flank was not secured until 4.33 p.m., when touch was obtained with the 10th Green Howards, who were digging themselves in to join up with the I 7th Division on their right. The Birch Tree and Shelter Woods were now in the hands of the Lincolnshire. After consolidation the battalion was relieved by the 12th Northumberland Fusiliers and withdrew to the Sunken Road, where they formed a local reserve. The casualties sustained during the day’s fighting were three officers (Lieutenant R.F.R. Herapath, and 2nd Lieutenants F. Hilton and F.C. Hills), and thirty-four other ranks killed : six officers (Lieut.-Colonel D.H.F. Grant, Lieutenants G.McI.S. Bruce, G.H. Hanning, and Lieutenants J.H.P. Barrett, G.M. Minnifie and W. Godfrey-Payton), and one hundred and ninety one other ranks wounded, and nine other ranks missing (p. 177-178). In the 1920’s James Buckingham’s family would commemorate the anniversary of his loss in the memorium column of the Grantham Journal. This would continue until the death of his father at the age of 66 in 1927.